Hello! 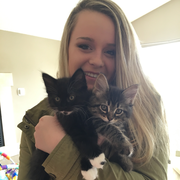 I am currently a student studying Elementary Education in hopes of one day becoming a kindergarten teacher, looking to make some money doing something I love and enjoy. The goals I have for myself as a caregiver is to make your lives easier as parents while having a fun time looking after your child(ren). I would describe myself as a very responsible, hard-working, dedicated, trustworthy, and flexible person to work with. I also have experience working in a childcare facility, having this experience is something I believe would help me to better care for child(ren). My supervisors would describe me as a responsible, safe, energetic, fun-loving, motherly care taker. I am also a very outdoorsy person and grew up camping, hiking, playing and exploring outside.